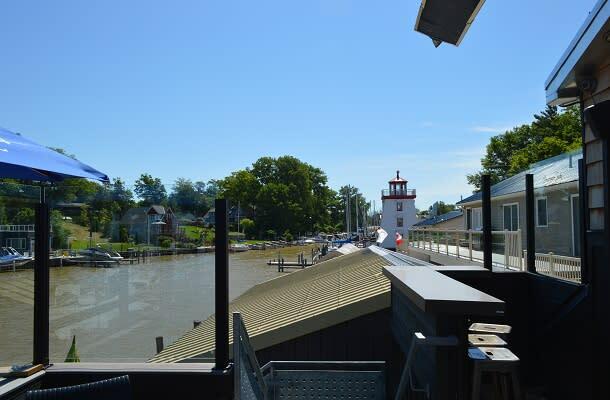 Flowing rivers, stunning shorelines, and city skylines are just some of the sites to see from Southwest Ontario’s best patios. The delicious food is just the start; these restaurants have some of the most beautiful views in all of Ontario. As its name suggests, the Viewpointe Estate Winery in Harrow, Ontario offers a breathtaking view of Lake Erie’s North Shore. Viewpointe offers seasonal fare that is thoughtfully prepared by resident chef, Jodie Brown, who uses local and sustainable products to make elaborate meals for guests to enjoy. Some of their delicious plates include smoked trout pate, a wild game board, and hand cut frites served with herbed aioli; each menu item even has a suggested wine pairing. Their 26 acre estate provides optimum conditions for producing world-class VQA wines, so grab a glass, a tasty treat, and a seat on their patio where you can take in the beautiful skies and shoreline. For a front row seat to one of the most beautiful sunsets in the world, head over to Smackwater Jack’s in Grand Bend, Ontario, where you can enjoy locally grown produce and local meat alongside refreshing craft beers. You can choose between their indoor seating and the spacious patio on the water’s edge where you can watch boaters come and go right on the mouth of the lake. With tasty delicacies like lobster rolls, tempura cheese curds, and beer from Railway City Brewing Company, Smackwater Jacks is the perfect stop after a long day at the beach. Located on the North Shore of Lake Erie just five minutes from downtown Port Dover is David’s Restaurant. With “three floors of fun” you can munch on locally grown or raised product while taking in the unforgettable sunsets and the beautiful expanse of the Long Point Biosphere in the distance. You can also head upstairs to the Double Olive Lounge, which is a unique lounge with live weekend entertainment that overlooks David’s manicured gardens, Lake Erie, and Long Point Bay. Voted number one on CNN’s 2014 “Best Beach Bars” Facebook poll, GT’s on the Beach is “…arguably the best beach bar north of the Caribbean” (Toronto Star, Aug 18, 2009). Check out their 400 seat patio right on the main beach in Port Stanley where you can soak up the sun and enjoy some local Lake Erie Perch with an icy margarita in hand. If you’re there on the weekend, you can enjoy live music while taking in some of the finest stretches of sand in Southwest Ontario. The Bistro at the River is just steps away from Windsor’s beautiful riverfront trail and the impressive Detroit skyline. Their patio, located at the water’s edge, is the perfect place to unwind and have a flavoursome meal with dishes like their Sweet & Spicy Citrus Calamari, which is tossed in a sweet orange chili sauce; the Eggplant Tower, cooked with basil and bocconcini; or the Roasted Garlic Avocado Burger, served with baby spinach, tomato, and red onion. 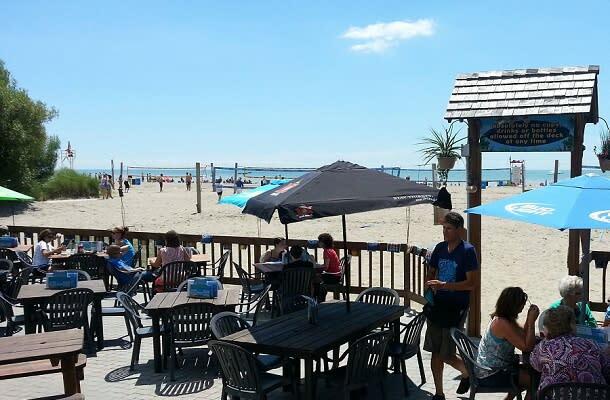 After a long day of soaking up the sun and playing in the sand, walk over to The Beach House in Port Dover where you can sit on their patio overlooking the beach’s towering palm trees and widespread shoreline. If you’re looking for a break from the heat, you can even see the glistening Lake Erie water and fine Port Dover sand from inside. If you’re a craft beer lover, check out Bayside Brewing Company in Erieau where you can delight in a refreshing pint on their patio that overlooks the beautiful Rondeau Bay. After a tour and tasting, grab lunch at the brewpub where they recommend beer pairings for your fare. Their pizzas, which use local ingredients, are all hand-made and baked in their wood-fired pizza oven, but if that’s not your cup of tea, test out the spicy sriracha cheddar balls or the fiesta burger. 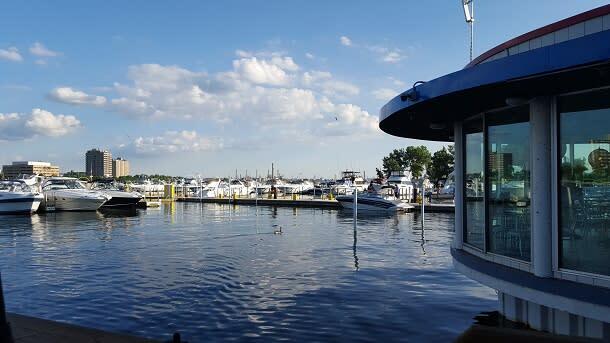 At the Sarnia Bay Marina, Alternate Grounds Dockside has the best view in the entire city. As the only water-top patio on this side of the St. Clair River, Alternate Grounds is a go-to stop for locals. With original breakfast options like the potato latke sandwich with poached eggs and brie cheese, or the lobster eggs benedict, your taste buds are in for quite the trip! Try their OB1 pierogies or the dockside dog during the summer on a Friday night, Saturday night or Sunday afternoon so that you can listen to some live local musicians while you eat. Looking for even more tasty local restaurants? We’ll help you find some of the best spots to eat in Ontario’s Southwest.